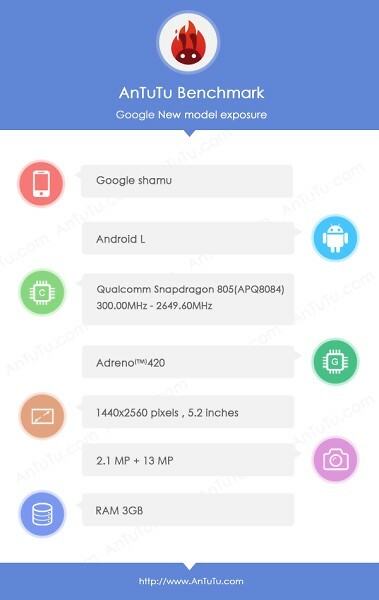 It looks like some specs of the Nexus 6 alongside its Motorola Shamu codename have been spotted under the benchmarking app AnTuTu. AnTuTu’s database contains the listing for a device called “Google shamu” sporting a Qualcomm Snapdragon 805 chipset with a quad-core Krait 450 processor working at 2,65GHz, 3GB of RAM and the Adreno 420 GPU. We also see a 5.2″ QHD (1,440 x 2,560 pixel) display. The camera weighs in at 13Megapixel alongside a 2.1MP front facing camera. Pretty beefy specs and something worth getting excited over. However, this could just be a list of speculated specifications, or place holder details for an upcoming announcement.